With best tape measure, you can accurately measure object’s dimensions. Measuring objects has been human fascination for more than 1000s years and serves to dawn of civilization, engineering and architectures and many other achievements. Now, most home have a tape measure for their day to day routines. These are used for industrial purposes. No matter what task, it’s important to measure with best tape measure in order to ensure the maximum accuracy level. Best tape measures are compared on the factors like, stand length, overall length, accuracy, durability, tang design, slide-locks, marking legibility, and magnetism. Primarily, you need to determine maximum length you usually take measurements in. If you do not need a 30 foot tape measure, do not get it, because it will take few extra space. Stand length is other important factor you need to compare. It can measure maximum length that you can stretch it out straight before the gravity takes over and it gets bend. Over 8 feet length is pretty good, and something more just becomes bragging fine and doesn’t really serve to be useful. Durability is another important thing to compare for best tape measure. At home or at work, you will be dropping it frequently. If it cracks on drop, you will need a new one. Markings on the tape get scratch off over some time if exposed to rough surface. Occasionally tape itself get bend when snapped it back that causes it to rip apart. 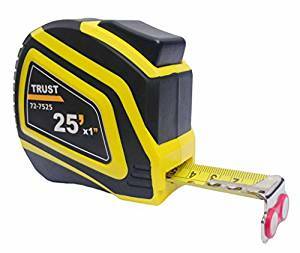 Buy the best tape measure that would not rip apart and a tape that is resistant of being dropped. Then comes the accuracy. You need to make sure that tape measure you are buying goes out straight and doesn’t tilt in any way. A slight tilt along x or y or horizontal or vertical bend will result in error. Markings on the tape must be easy to read and not confusing. Another important feature is the design of tang. Tang is the buckle on the end of tape which holds it to a surface. You need a fine sturdy wide tang, which will easily clasp on things and avoid tape from retracting. Most if not all tape measure have a mechanism of slide-lock which will auto-lock tape in place where desired measuring length is reached. Finally few tapes are magnetic, that truly comes in handy while you need to work on metals such as ducts, pipes, and beams. Tape itself get snap on the metal therefore you do not need to worry about tape moving here and there. After testing 20 different tape measures by dropping them, measuring several different objects, and performing every single test possible, we have factored all different ways to compare and picked 3 best tape measure out of them. Here are there reviews. 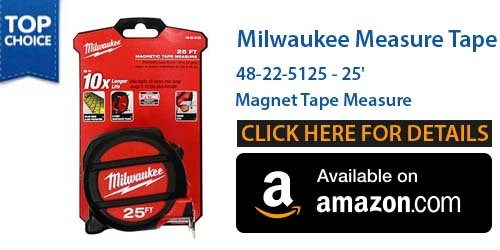 Milwaukee offers best bang value for your money and it is superior then other famous tape measures that sells on their brands and ratings alone. The craftsmanship in Miwaukee tape Measure is really admirable, which it shows by superior durability while we performed smash tests. Among all, it withstood the most damages and remained intact after we run a car over it. When rubbed with rough surfaces, its marking remains much visible without any scratch marks. 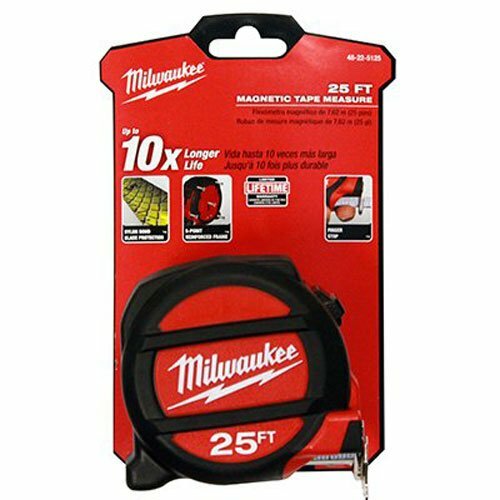 Milwaukee is the best tape measure just not because of durability. It has slew of features. Perfection is truly in the details. It features a nylon blade protector that means it is well protected and padded against abrasions. Its sturdiness can be felt of band while bringing it in and out. It doesn’t look like it will snap or break on you soon. It makes a loud noise when moving which is bit annoying. A finger catcher is there at the end of tape to avoid hurting your index finger on way back. At the end of tape band is magnetic to firmly latch on the metal objects. This feature is cool as it avoid tape from rolling around when you hooked it on metals. Its standout length is 9 ft. that is sufficient for all types of work. Moreover, it squeezes in nice finishing touches. Markings are available on both sides with different scales for professionals to use for specific needs. A metal belt clip is there to keep it with your belt firmly. Overall it is a best tape measure for those who want great durability and do not mind paying premium. Stanley is most famous brand for tape measures and considered the best brand out there and chosen for Apollo 11 lunar landing projects. While we applaud Stanley, we do not necessarily agree that Stanley is the best. Best is Milwaukee, which is clearly more durable. Yet, Stanley makes solid tapes measures and been there for over 160 years. While Stanley is famous for Powerlock series, its FatMax is quite better and improved version that features Mylar Coated steel blades which is a material thicker than tylon. Its improved Mylar coating provides blade around 10 times more resistance against abrasion as compared to traditional tylon coating. FatMax have the name from its blade, that is extra wide at 1.25 inches and provides extra durability and easy to read markings. It is remarkably wider than Stanley Powerlock and other brands that have only 1 inch. First 6 ft. of blade has something called blade armor that is an extra protection layer to prevent breaking and snapping. This blade armor is made from industrial thermoplastic coating that is used in black hawk helicopters rotor blades. Hook is really sturdy and can hook on top as well as bottom. Best part is it has 11 ft. stand still length that is at the top and really handy while you are working alone and trying to measures objects form great distances. While holding it in hand, it can be felt that it is heavier, sturdy and durable than Powerlock. Its protective casing contain blade which is extra tough and can withstands with most if not all drop tests. Although not as toughest as Milwaukee, but stands as a great contender. 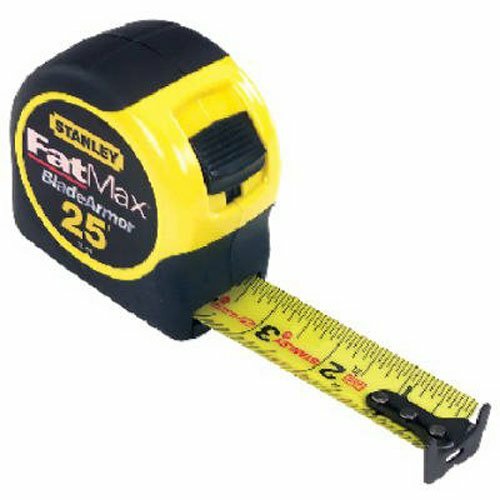 Overall, Stanley FatMax is best tape measure for those who want fatter blade with long stand out length. 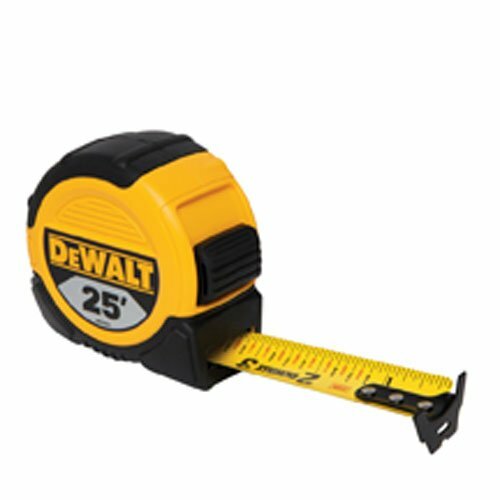 Dewalt is best tape measure if you need an incredibly long standout length i.e. 13 ft. Dewalt is built similar to Stanley FatMax and have similar look even. It is 1 and 1/8 inches wide, that is slightly less than FatMax however a sizable width. The blade is coated with Mylar and has a double ended large hook at end of the blade similar to FatMax. Although we find it easier to use, but the difference between Dewalt and Fatmax is negligible. When it is about durability, Dewalt has sturdy outer shell, reinforced by metal as well as rubber for more cushion from drop. It include duo durometer blade lock which is easy to use. In terms of accuracy and durability it is comparable to FatMax. Because of Mylar coating they both can take quite a beating and their blade is tough and stable to snap. Blades are accurate and doesn’t tilt at any axis. Although difference between FatMax and Dewalt is miniscule, FatMax is still preferable. The only thing that is annoying is blade lock system of Dewalt, which is although better, we kept higher standards to compare and factor best tape measure. Blade lock system of Dewalt isn’t quite on par with Stanley FatMax and Milwaukee. It is a bit flimsy and you have a kind of feeling that blade isn’t quite locked firmly. A tiny bump could send blade retracting back. Overall, we think Dewalt and FatMax are comparable with slight advantage to FatMax. Trust measuring tape is faster and easier to use because of clearly marked inch fractions that saves your time counting through marking. It also has a magnetic tip with long stand out. Ergonomic ABS case is comfortable and tough. With non-slip rubber coating it has a good grip. 0.14 mm thick blade is better and durable. Super strong 65MN spring roll allow you to ensure it snaps back each time. It has ultra precise metric and imperial markings, so you can rest assured with precise work all the time. With auto locking blades your work will be easier, no more fumbling with a hand to hold on work. When extended blade automatically locks and retract back with a press of button when you are done. 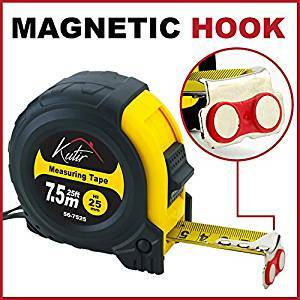 Along with magnetic hook, easy to read measurements marking, stud marks after every 16 inches, blade that can stand out 8.5 ft., auto locking system, this can one of the easiest measuring tape out there. Kutir measuring tape is favored among professional builders, handymen and carpenters for various reasons. First it has a strong magnetic end which makes it easier to obtain accurate measurements. Magnet is chrome plated to save it from rusting, and blade is made from durable stainless steel. There is a large measurements indicator such as 16 inch and feet marking with metric and inch measure therefore you can measure precisely. Be it a household man, stay at home mom or a survivalist, this tape is great. You can use it at garage, home, wood work shop or in office because it is made from shock resistant ABS material. It has a 7 ft. stand out with both CM metric and inch ruler. It has a shock absorbent rubber case and a magnetic hook. Overall its price v/s performance makes it best of all. With a sturdy matte blade you can easily measure 0.15 mm thickness to 7 ft. This 25 foot tape is durable and strong.